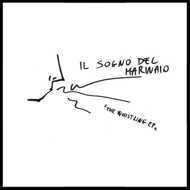 Il Sogno Del Marinaio (translated as “The Sailor’s Dream”) is a collaboration between bass legend Mike Watt (Minutemen, fIREHOSE, The Stooges) and Italian musicians Stefano Pilia and Andrea Belfi. The Whistling EP features the first new music from the band since their 2014 release, Canto Secondo. The three song EP will be pressed on 7" color vinyl, limited to 1,000 copies worldwide, exclusively for Record Store Day 2016.